Innovation and start-ups go hand in hand. So it’s not surprise that the Internet of Things (IoT) ‘Start-up Showcase’ was a highlight at Semicon West 2014. This session featured five start-ups whose technology demonstrated not only the exciting products that are driving the IoT wave, but also the importance of R&D and patent-protected inventions. Pellucid GPS: This early stage start-up is promising a potentially disruptive, low-power GPS device. The technology is based a much simpler circuitry (no multipliers and adders, for example), enabling it to process GPS data very quickly. As a result, the device only needs to be switched on for a very short time, thereby using minimal power. Pellucid claims its ’Zero Energy’ technology increases talk time on the iPhone 5 by 15%, and increases the Nike Fuel Band from six hours to an incredible 92 hours. Based on two US ’defendable’ patents, the technology can be implemented with today’s technology and offers an almost too-good-to-be-true best performance, lowest cost and smallest footprint GPS device that is especially suitable for IoT devices. Personally, I would appreciate not having to worry about the battery sapping smartphone GPS app during my weekend long runs! Lumiode: Lumiode is developing emissive LED microdisplays that are 10x more efficient and 30x brighter than existing technologies such as organic light emitting diodes (OLEDs) and digital light processing (DLP). Founder and CEO Vincent Lee invented the core technology while completing his studies at Columbia University. In turn, Columbia has given an exclusive license of the patented technology to Lumiode. Lumiode’s microdisplays are low power, compact (less than an inch diagonal) and are easily readable in bright daylight, making them ideal for head-mounted devices such as glasses and helmets. With these displays, real-time information and graphics from IoT devices would be delivered to the user to provide for a truly interactive augmented reality experience. Ironman should definitely get Lumiode to upgrade his heads-up display. CHIRP Microsystems: This fabless start-up provides a low-power micro-electromechanical systems (MEMS) ultrasonic 3D-sensing solution. Traditional approaches which use light to detect objects in 3D are computationally intensive and use a lot of power. CHIRP’s technology, originally developed at the Berkeley Sensor and Actuator Center, uses ultrasonic transducers to generate sound waves and determine the location of an object from the echo of the waves. An early demo of the technology shows how users can control a tablet with gestures – similar to how you interact with the Xbox Kinect. Other applications that could use this ultrasound technology include medical and industrial imaging, and automotive collision detection. The solution uses only microwatts of power and has an extremely small footprint, making it a great enabling technology to interface with the always-on connected devices of the IoT. ChemiSense: This wearable company is developing a personal air quality monitoring device and companion app that provides real-time alerts on the harmful chemicals and pollutants in the air you breathe. With the data collected from users, the app provides a real-time crowd-source map showing the air quality of applicable areas. ChemiSense is initially targeting a segment of the asthma market, but there are huge opportunities in healthcare and other industries such as mining, oil & gas, defense – essentially any industry that involves dangerous and toxic working environments. Their product and $150 price point are comparable with other popular personal fitness wearables, and therefore should ease user adoption. Arrayent: describes their Connect Platform as an IoT operating system in the cloud. Their approach is to shift the complexity from IoT devices to their own software platform, thus helping manufacturers develop IoT devices quicker, cheaper, more reliable, and easier for consumers to install and use. Arrayent’s platform offers tools and services to support disparate wireless local area network protocols, a comprehensive device management, data analytics and application framework for enterprise and consumer application development. At core, Arrayent is helping solve issues – such as security, disparate connectivity technologies and lack of standardization – that must be resolved if the IoT is to be fully implemented. Impressively, they have developed partnerships with leading silicon device vendors, and their solution has been incorporated in consumer electronics and appliances from some of the top vendors. Not surprisingly, providing IoT platform solutions is a very crowded space, but Arrayent appears to have traction. The products from these five companies exemplify the innovation and diversity of the ’very different’ things of the IoT. It will take time before clear leaders emerge from the inevitable shakeout. Fortunately, the sheer size and diversity of IoT should allow for far more technology companies to thrive than in the increasingly monopolistic smartphone and tablet market. To everyone who loves technology, it’ll be fun to watch start-ups and established companies alike push the envelope with new technology and intellectual property as they clamor to ride the next big wave. What’s the Internet of Things, anyway? There are a host of reasons to love San Francisco. Great food, picturesque vistas – and inspirational technology. That’s why for so many engineers, Semicon West is a like a hot-spot tourist destination. And at this year’s show, the sun was shining on the Internet of Things (IoT). Mark Adams, President of Micron Technology, kicked off Semicon with a keynote on Innovation and Partnership. He emphasized the accelerated adoption of technology and discussed the five big trends driving the semiconductor industry: Networking, Machine to Machine (M2M), Mobile, Cloud, and Big Data. Semiconductor companies and their suppliers will need to collaborate more than ever before – while continuing to innovate – to handle mounting challenges and be successful in diversified end-market segments. While Adams was one of the few speakers who didn’t explicitly call out the IoT, the trends and themes of innovation, partnership and market diversity are suitably applicable to the topic that dominated many of the conference sessions. There’s certainly a buzz on connected devices, driven by the release of smartwatches like the Pebble that was crowd funded on Kickstarter, the Samsung Galaxy Gear, fitness trackers like Fitbit and Jawbone UP24, and the just-announced Apple Health app and HealthKit for health and fitness hardware vendors and iOS app developers. But it’s confusing to know how these categories relate to the IoT. Adding to the category blur is M2M, which some in the cellular industry use interchangeably with the IoT. It’s best to think of M2M as the incumbent category of IoT, whose devices are connected via cellular technology and used in end markets such as asset management (inventory tracking) , automotive (think OnStar), and energy & utilities (diagnostics monitoring of pipelines). The term Internet of Things is not new. It was coined in 1999 by Kevin Ashton in his presentation linking RFID to the internet in Procter & Gamble’s supply chain. Research giant Gartner defines the IoT as “The network of physical objects that contain embedded technology to communicate and sense or interact with their internal state or the external environment.” But this definition focuses on the devices – the everyday things that can be connected to the internet – and not enough on the networking and interaction among devices. 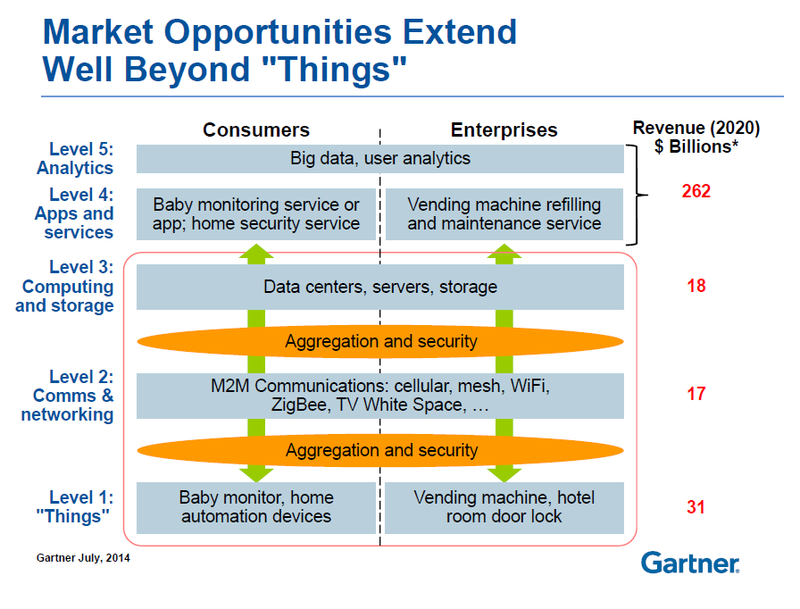 The scope of the IoT and its potential value gets clearer when reviewing Gartner’s outlook of the market opportunities for the “Things” and the different levels of the IoT stack. This graphic is intended to show semiconductor companies where they can position their computing, sensing and connectivity solutions and partake in the market opportunity in each of the different levels. But this stack of building blocks may also be thought of as the IoT ecosystem, where individual “Things” can intelligently interact with other “Things” interfacing with the different levels of the IoT stack. Control of the different Things in the IoT could be based on user-defined rules and collected data in a far more meaningful way than the results achieved by individual connected devices. This is similar to how the web service IFTTT can simplify your life by automating interactions among different web applications. Before the tech industry can unlock the true potential of the IoT, there’s a lot of work to be done to deal with the diversity of devices, heterogenous connectivity protocols, multiple standard bodies, security and privacy concerns, competing platforms, and so on. These challenges can be mind boggling, and the solutions will require innovation in each level of the IoT stack, and collaboration among hot startups and established giants. If the IoT Startup Showcase (the topic of my next post) is any indication, I’m bullish that the full value of the IoT will be unleased sooner rather than later. Jeff Robertson – July 22, Final – 735 words. Posted Aug 6-7/14. Communication theory gave us the concept of the signal to noise ratio as a measure of the useful information in a message. I propose a new metric: buzzwords per square meter. The highest values seem to be found at trade shows and industry conferences. Semicon West 2014, held in San Francisco in July, was no exception. It was hard to find a presentation which didn’t reference the Internet of Things (IoT). It’s easy to see why: with analysts sizing the market at $30 billion annually ($5 billion for semiconductors alone), everyone wants a piece. Or, as was the case at Semicon, they want to persuade you that you’ll get your piece if you use their product. The premise of the IoT is that anything that could be connected to the Internet will be, whether it’s a wearable (a Bluetooth-enabled running shoe evaluating your stride), your thermostat, or even a mundane FedEx package. The only way to get to billions of connected devices, compared to merely millions of smartphones, is to find a way to make these devices much more cheaply. Luckily, they don’t have to be as powerful as a smartphone, so that helps. Now, when you gather engineers at a conference, they naturally want to talk about the latest “hero” demonstration. In the optical transport business, it’s sending the most bits down the longest piece of optical fiber. With sports cars, it’s top speeds and zero-to-sixty times. At Semicon, it was all about who’s got the smallest semiconductor manufacturing process geometry, and who’s going to be first to the next one. But it’s at the older, larger geometries that the IoT is really going to happen. There are two main reasons for this. First, devices made at 65 nanometers (nm), 45nm, or even 28nm are much less expensive. The yield problems being experienced at leading-edge sub-28nm nodes are not going away any time soon, and costs appear poised to stay high. (Moore’s law seems to fraying around the edges – we haven’t hit the physics wall yet, but the economic advantages of the die shrinks don’t seem to be as reliable as they were in every past transition.) Luckily, we don’t need the most powerful ARM processor in our Bluetooth sneaker; a simple 90nm microcontroller is sufficient even for the Samsung Gear Fit. Second, the desire for compact, integrated designs motivates the use of embedded SRAM and Flash, and embedded SRAM isn’t scaling well below 28nm. Heroes may capture the spotlight, but there’s plenty of work left for the everyman to do. On the chip packaging side, the future isn’t so easy to read. Engineers are a pragmatic bunch, and they’ve tried pretty much every packaging technology for mobile chips, particularly for wearable applications, and there’s no clear winner. Cost will again be the primary driver, but IoT applications can have some pretty demanding environmental requirements, so the cheapest solution may not be the right one. Finally, we have sensors. Sensors are the raison d’etre for IoT devices, particularly medical/fitness wearables. A big part of the reason we’re able to even able to conceive of the IoT is that the cost of sensors has fallen through the floor in recent years, thanks to the enormously competitive environment of the smartphone market. That means that margins are pretty poor. When asked who was going to profit from the IoT, Kurt Peterson, speaking at the Silicon Innovation Forum, would only say that it wouldn’t be the sensor makers. But as they advertising saying goes, “How do we do it? Volume!” According to Gartner, the sensor market grew at 6% in 2013, and is expected to grow 10% annually through 2018, so those manufacturers who are able to scale and find innovative cost reduction opportunities will succeed. As an analyst, it’s fun going to trade shows and trying to separate fact from spin. One thing that can’t be spun is that Semicon was smaller than in past years. This is likely due to ongoing consolidation, which is a sign of a mature industry. One cynic called consolidation the enemy of innovation– opining that big sclerotic companies favour the status quo – but I saw no shortage of innovating start-ups offering everything from new FinFET architectures to silicon nanowires. Every one of those start-ups made a point of emphasising their patent portfolios. Innovation is alive and well, and the innovators are relying on their patents to protect and reward them.